Use only containers that are winter safe. Porous pots, like terra cotta, are not a good choice as they tend to crack when they freeze. Better choices include cast iron or aluminum urns, fiberglass or foam containers and cocoa-lined wire hanging baskets and troughs. For a truly holiday look, consider containers that may have red-and-green coloration or other holiday hues, or look for whimsical holiday-themed designs. Use the soil that is already in your containers. Remove just the tops from your previous plantings, allowing their roots to remain in the soil as an anchor for your winter arrangement. OASIS Floral foam is another good choice that works well for smaller outdoor arrangements like those in hanging baskets. You may also need some plant or gardening pins to help keep your arrangement in place and secure. Begin by adding greens to your container (note: your greens will last longer if soaked in Wilt-Pruf for 24 hours before using). Cut branches to the desired length and remove all green needles from the portion that will be inserted into the soil. Create a dense base for your arrangement using either white pine or spruce. Consider allowing some boughs to trail over the edge of the arrangement for more visual interest, or mix up different types of greens for interesting texture. Create a focal point for your arrangement with the addition of a few tall branches of curly willow, Harry Lauder’s Walking Stick, red twig dogwood or white painted birch. Position these taller elements near the back of the arrangement to allow more room for additional plants and decorative items. To add more magic to the arrangement, consider painting taller branches gold or silver. To include additional color and texture, incorporate more winter-themed plants into the arrangement. Magnolia leaves, holly, incense cedar, winterberry, China berry, pepper berry, protea, eucalyptus or other decorative branches and berries are all top choices. Go for a lush, tiered look for the best effect. To bring your arrangement to life add mini white or colored lights, desired ornaments and weather-proof ribbon. For a more whimsical look, consider garlands, candy canes, cranberry strings or even a fairy gingerbread house. 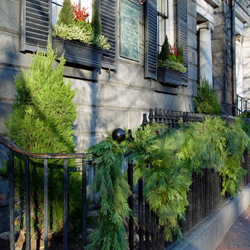 Remove these when the holiday season ends and leave the arrangement intact until time for spring planting. You might spruce up around the pot to bring even more notice to your arrangement. 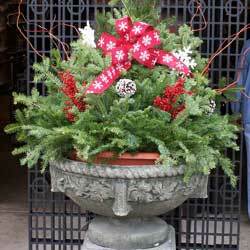 Consider a ribbon around the pot, or add light-up gift boxes or wrapped boxes around the pot to create a larger focus. With just a few steps, the outdoor containers you enjoy in spring, summer and fall can continue to be lovely accents for holiday and winter decoration.